Buy Assassin's Creed® Syndicate - Gold Edition and get the games download now! NOTE: Activation key must be used on a valid Uplay account, requires internet connection. Champion justice — As Jacob Frye, a young and reckless Assassin, use your skills to help those trampled by the march of progress. From freeing exploited children used as slave labour in factories, to stealing precious assets from enemy boats, you will stop at nothing to bring justice back to London’s streets. Command London’s underworld — To reclaim London for the people, you will need an army. As a gang leader, strengthen your stronghold and rally rival gang members to your cause, in order to take back the capital from the Templars’ hold. 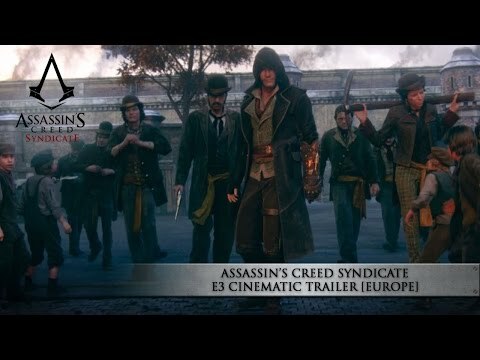 A new dynamic fighting system — In Assassin’s Creed Syndicate, action is fast-paced and brutal. As a master of combat, combine powerful multi-kills and countermoves to strike your enemies down. A whole new arsenal — Choose your own way to fight enemies. Take advantage of the Rope Launcher technology to be as stealthy as ever and strike with your Hidden Blade. Or choose the kukri knife and the brass knuckles to get the drop on your enemies. A new age of transportation — In London, the systemic vehicles offer an ever-changing environment. Drive carriages to chase your target, use your parkour skills to engage in epic fights atop high-speed trains, or make your own way amongst the boats of the River Thames. A vast open world — Travel the city at the height of the Industrial Revolution and meet iconic historical figures. From Westminster to Whitechapel, you will come across Darwin, Dickens, Queen Victoria… and many more.